To be fair, I don't think the "Prevail Statement" argues for 2010 or 20102. It argues that 2010 is too sooon and we should wait indefinitely. They are really talking about 2014 or beyond. I agree with the Love, Honor, Cherish statement in support of 2010, and I think the vast majority of our LGBT activists and community agree, as well. The "Prepare to Pravail" statement is a bump in the road, but I think it will ultimately be up to our large and growing, fired-up, grass-roots organizations and activists to mount the winning fight for equal marriage rights, not the lumbering and largely discredited mainstream lobby groups. Full steam ahead to 2010! I think the statement is arguing or siding for "2010 or 20102", just a direct statement saying that those organizations don't want to see the same mistake made last time. basically, in order to avoid the damage that prop 8 had did we will need to address those eight concerns. simple. so, have we met these concerns? in my opinion, i don't think we have. I think the movement needs to ask itself whether it can realistically raise the $40-$60 million it will take to mount a realistic campaign. My sense is that most of the folks who funded the No on 8 campaign will not return as donors unless there is a winning message supported by polling that shows us clearly winning. So can the new grassroots organizations demonstrate that they can raise the money it will take to win? I'm voting for 2010. Let's take this momentum and ride the wave. The statement you mention as being from the Latino Equality Alliance ("LEA") is actually from a member of Honor PAC who is criticizing LEA. LEA is on recoprd in support of a 2010 initiative and that has not chaged. The statement from LHC in response to the "Let's Wait" letter is being joined by other organizations, including Somos Familia. Thank you, Lester. I corrected my wording as I realized it was misleading as to who was saying what. I want to be sure everything is portrayed accurately and with respect. To be fair, the statement does not say for waiting indefinitely. It says "a future year." Last time I checked, 2012 is in the future, and defintely a year. For someone so dedicated to making sure things are kept honest, you've managed to twist the words of three organizations that do honest, good, hard work in communities. Instead of constructive, you've decided to take arms against other people working to accomplish the same goals of equality. There is no love, honor, or cherish in your statements. Just simple hate. Thanks for posting. I value lots the contribution Unite the Fight makes to the community’s efforts. So to hit the specific issues you raise, the two consultants you mention as having worked for No on 8 were actually brought in during the last two to three weeks to help try to right the ship (that's what I understand from those who were involved--I was still duking it out in Massachusetts and Connecticut then). They were not lead strategists and did not devise the campaign plan for No on 8. Instead, they were folks who had extremely stellar records in California, who cared a lot about the issue, and who wanted to help out towards the end. Of the seven folks we reached out to, three are openly LGBT. One, Sue Burnside, is a superstar grassroots/field expert based in LA who is part of one of the 18,000 couples that was able to marry. She has worked on field strategy on marriage equality in Hawaii and she co-chairs a key board of the LGBT Victory Fund, which helps get openly LGBT people elected to office. Another, Dave Fleischer, has been involved in devising and implementing field strategy on literally dozens of LGBT-related referenda on the local and state level. He knows more than anyone else I can think of about how to move voters on LGBT equality issues at their doors. Anyhow, the idea here is not to rely on any one consultant as having the silver bullet answer (though of course I’d love it if they did). But instead to get some really good information from smart people who have been involved in winning—and losing—campaigns, and add it to our community’s collective wisdom. Thank you very much for addressing the concerns mentioned in this post and providing the readership and myself more information on what is happening at EQCA. It is truly a sign of engagement from you and that some things have definitely changed at EQCA since No on 8. I'm also heartened to hear that going to the consultants isn't a knee jerk reaction if and when at a loss on how to proceed (which was witnessed in the past), but just a further gathering of information. This sort of engagement from EQCA and the other large organizations is exactly what the community has been clamoring for as well as an active role in future developments. Please continue respond to posts here at Unite the Fight as you see fit when concerns are brought up or perhaps when information listed here needs updating or correcting. As you already know, many of the wounds from No on 8 have yet to heal, but a continuing involvement with the community will always be seen as a step in the right direction. In response to "R of WeHo" I am a lawyer and so are the authors of the Wait, Wait Manifesto. I know that when someone uses language like "a future date,"there is a reson. If they wanted to say 2012 they would have. Sveral of the signatories are talking about 2014 at the earliest. It is important that the community understand the import of what a decsion to not go to the ballot in 2010 is. UTF, you make some good points about which consultants EQCA is looking to for help in deciding how to proceed in the fight for equality. It is great to hear the response from Marc Solomon of EQCA. It sounds like he is interested in learning from the community and is sensitive to our concerns. I think the “wounds from No on 8” are important for us to remember – not to assign blame but to use for learning how not to repeat the same mistakes again. The only consultant included in the EQCA list that raises questions is Rick Claussen. His group, Goddard Claussen, may have a good reputation for winning, but when checking out their client list, most of their successes are for campaigns fighting health care reform (they take credit for ‘Harry and Louise’) and supporting many business-related causes. I trust that Marc knows who he is his dealing with, but it seems like an odd choice. It is good that some of the late-comers to the 2008 campaign are included at this stage, but I would encourage Marc to include as many new participants as possible. His approach to using consultants is also on the right track. 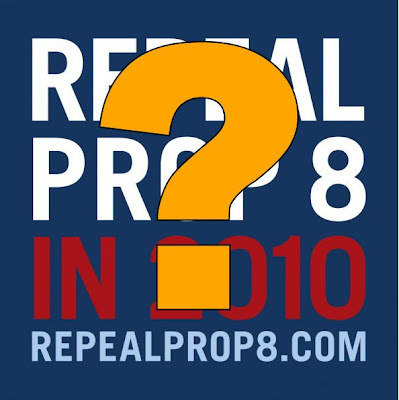 They can be valuable resources, but the campaign for repealing Prop 8 needs to be managed by people who are committed to the cause and not in it only for the paycheck. Because we got burned last time it will be difficult for any group such as EQCA to earn back the trust of the community. We are more wary and more prepared than last time. This discussion on UTF is a good example of the level of engagement anyone who wants to manage the campaign can expect to see. I attended the Get Engaged Tour/Love Honor Cherish meeting in West Hollywood last night and saw the presentation on the research recently done to determine the messages to use for supporting marriage equality. Almost everything pointed in a different direction than was used last year; and it is disheartening to realize that this same information could have been used by a smart group of people during the campaign and we could have been successful. Hopefully there is a smarter group of people leading the charge this time. You can't criticize Prepare to Prevail for posting their opinions to the public before the leadership summit. Love Honor Cherish and those in favor of 2010 had signs printed and campaigns launched for 2010 for months, as seen at the last leadership summit. Speaking of which, not everyone knows about those summits and not everyone is able or willing to attend. I know the Prevail groups felt this way for sometime, but they didn't engage the pro-2010 groups who now feel some trust has been broken in that they weren't approached first. Many of these groups I have worked with and highly respect, which is why I'm glad they have now chosen to speak up. They are involved constantly with pro-2010 groups. I just wish these points could have been made in the plenty of meetings held before so that an actual discussion could have been had. But instead, I fear (and am witnessing) how they released the statement, such as going to the press and not engaging pro-2010 groups in discussion (could also have been done at the summit), will overshadow the very important message their sending. As for the summit, the Get Engaged Tour has gone across the whole state with numerous town halls talking about the new polling data and communicating about the summit, involving as many groups as possible. I understand not all will be able to attend, but if, as you say it's as simple as not being willing, then they forfeit the right to complain later. In the end, I hope we can all set aside the drama behind the releasing of the statement (what's done is done) and actually discuss what the statement says. Because if we don't address the issues it brings up, we're in deep trouble.